We meet to rehearse every Wednesday at 7:30 p.m. in the choir room. We have no auditions and everyone is welcome. 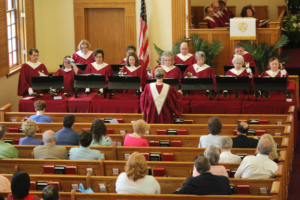 We sing at the 10:45 a.m. worship service from September to June. Our men have formed a special ensemble called the Praise Hymns who sing once a month in worship and on many special occasions. We practice on Wednesdays at 8:45 p.m. in the choir room. 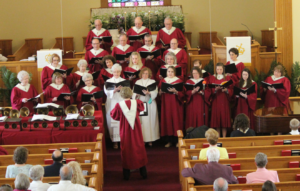 Our bell choir, called the Majestic Ringers, is open to those who have rhythmic skills. We meet Wednesdays at 6:15 p.m. in the choir room. 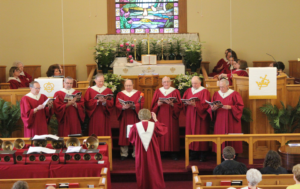 ​Our Praise Band is open to all who love to sing and play praise music. We meet on Thursdays at 7:30 pm in the Fellowship Hall. If you would like more information please contact Sam Wigal @ Samuelwigal95@gmail.com.